On Wednesday, GM disclosed that Chevy Volt owners have collectively driven 150 million electric-powered Volt driving miles, roughly the distance from Earth to Mars, and are routinely exceeding the EPA-certified 98 miles/gallon-equivalent fuel efficiency. 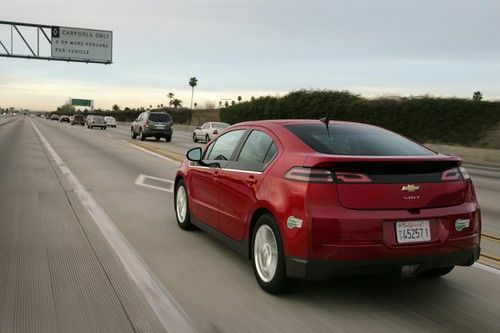 The Chevy Volt is GM's first plug-in electrified car since the EV1, it has been on sale since early 2011, and is rated for 98 MPGe combined when driven on electricity only, and 37 MPG combined in hybrid mode. According to GM's records, the average Volt owner is driving over 900 miles between fillups. Even though the company calls it an electric car, the Volt is a plug-in hybrid meaning that its' battery pack (16 kilowatt-hours) is large enough to drive the car on electricity for about 38 miles, and has gasoline engine whose primary purpose is recharging the battery pack if needed. This means a careful Volt owner can perform the majority of their driving on electricity, and rarely have the gas engine turn on. This avoids burning a lot of gasoline, which avoids the expense of buying that fuel, and avoids the environmental footprint of doing so. “It’s been more than 5,000 miles and I’ve only filled up once not including the dealer fill,” said Larry Read of Canyon Lake, Texas. While GM collects this sort of information from Chevy Volt's in the field, some Volt owners are publishing their fuel efficiency data on the crowdsourced VoltStats website. A perusal of that website is all one needs to confirm GM's claims about the distance a Volt owner often drives between fillups.